Some Dell laptops came bundled with “Trend Micro Client/Server Security Agent” which most people will want to uninstall. I recently had to restore a Dell Latitude E6430 to the Factory Defaults. When removing the bundled bloatware, uninstalling “Trend Micro Client/Server Security Agent” froze up and I had to kill the process. Upon rebooting, it was still partially installed. 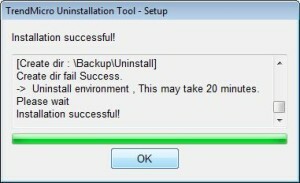 However, when I tried uninstalling again, Trend Micro was prompting me for a password to uninstall it. Lots of searching kept leading me to Trend Micro removal tools that just flat out failed. I started to notice all the removal tools were for WFBS CSA 5.0+, WFBS SA 6.0+, Titanium 2011+, Diagnostic Toolkit, etc…. I looked in Windows Programs and Features and noticed the Trend Micro Client/Server Security Agent Product Version: 3.5.1163 matched nothing I could find on Trend Micro’s website. After hours of digging, I found a sure fire way to remove this program. I’ll list some of the “common” solutions below and finish with my guaranteed procedure. 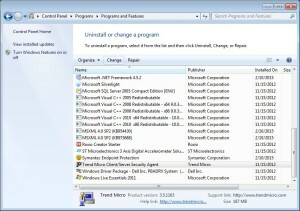 Download the uninstall tool direct from Trend Micro OR direct from sigkillit.com (In case they pull their copy down). 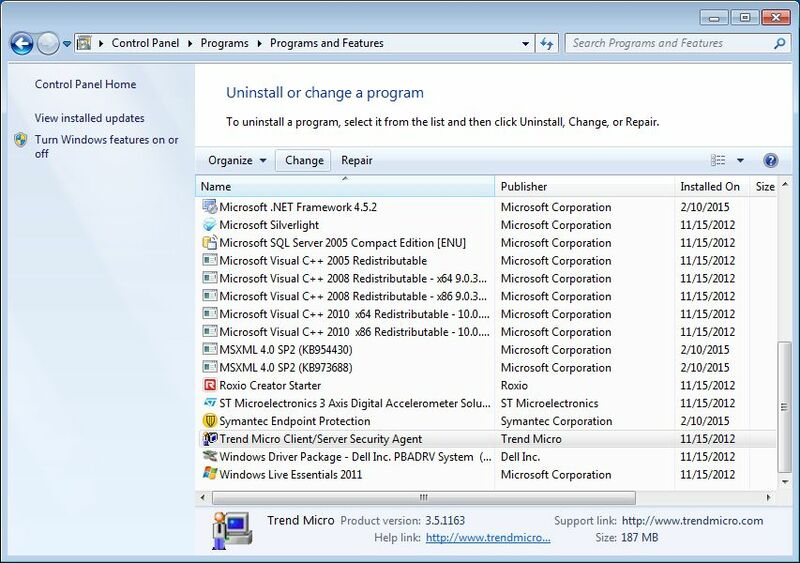 This method uses a special uninstall tool that’s not publicly listed on Trend Micro’s website. The tool is not graceful, will throw prompts you need to dismiss, and you’ll probably need to manually close it out. With that being said, here’s what you need to do. Check in Programs and Features and the Trend Micro Client/Server Security Agent will be gone!